You've really got to be something special to make it as a professional footballer. The transition between being an academy prospect to a fully fledged, contracted player is huge, with many youngsters dropping out of the game aged sixteen/seventeen after being released by professional clubs for a variety of different reasons, ranging from a lack of physicality to a lack of overall ability. For some, rejection at such an early age can lead to a resentment of the game, which in turn sees players halt participation all together, maybe going back to it years in the future at a much lower, social level with mates. For most, though, they will continue to play and prove themselves; prove that they have got what it takes to become a pro and show their former clubs exactly what they're missing by making it elsewhere. Hundreds of young pro's who have been released from top flight academy systems sign with teams in the National League, in order to gain valuable first-team experience in a physically demanding league with experienced professionals who have been around the game for years. They can learn from these players and use their experience to benefit them in the long run, in the hope that eventually it'll pay off and they'll make it back to the big time, or at least in League One. In recent seasons, however, we are seeing more and more young professional footballers go against the grain and try something different. Perhaps inspired by the dramatic rise of a certain Jadon Sancho - who decided to up sticks and move to Germany and sign with Bundesliga title challengers Borussia Dortmund in 2017 having left Manchester City. Hundreds, if not thousands, of young British footballers are now competing in some of Europe's most obscure leagues, from the Norwegian Eliteserien to the Danish second division. Eredivisie outfit Vitesse have long been known as Chelsea's feeder club, with many of the club's young pro's spending time on loan at the Dutch side to gain first team experience that they can use playing for anyone but Chelsea in England's lower leagues. This season however, there's something very different happening in Sweden, but it's not in the country's top division, nor is it in the second-tier, or the third. Way down in the depths of the Scandinavian country's fourth-tier - the Division 2 Norrland - there is a team named Ytterhogdals IK (try saying that after a few beers). They draw in a typical attendance of around 250 each week and play at a stadium you would expect to see in the Southern League - England's seventh-tier. So, what exactly is so special about this club? And why on earth are you wasting my time telling me about them, I hear you ask. Well, it's because this season, the club have gone professional and boast a roster full of young British footballers - twenty of them, to be precise. Led by English manager Adie Costello, previously of Northern Counties East side Garforth Town and Hull City Ladies, this tiny club based in the isolated Swedish village of Ytterhogdal, which inhabits less than 700 people, is offering young British footballers a route back into the game. All but five of Ytterhogdals squad are British, with the likes of Manchester United, Preston North End, Fleetwood Town, Sunderland, Wolves and Grimsby Town all making up the list of former clubs frequented by their current squad members. Alexander McBurnie - younger brother of Swansea City and Scotland's Ollie - is just one of twenty British players currently plying his trade at one of Europe's most bizarre-yet-exciting clubs this season. The team train twice each day, live together in a hostel in a village 100 miles from the nearest town and are funded by wealthy local farmers. Throughout winter - where temperatures can plummet as low as -30 in the Nordic country - the Swedish minnows were forced to complete their pre-season training in various different indoor facilities, with a temporary 4G home pitch in Ljusdal housing them until the unforgiving climate allows them to play on their grass pitch in Ytterhogdal towards the back end of May. Ytterhogdals are the only full-time, professional outfit in all of the Swedish lower divisions, so it's unsurprising to see that they are currently joint favourites to win the league in October. The club's skipper, Sam Alderson, is a 21-year-old winger from Maidenhead. Formerly of Leyton Orient, Alderson moved to Sweden as part of the League Football Education's (LFE) player placement programme, which over the years has seen players released from clubs in England offered the opportunity to play in Sweden. Should they impress during this period they're asked to stay for longer, with many players going on to forge professional careers in the country. Ostersunds FK, who last season made headlines by qualifying from their Europa League group and beating Arsenal at the Emirates, have benefited from the program funded by the EU's Eramus+ project. Former York City midfielder Jamie Hopcutt, who joined in 2012 whilst now-Swansea manager Graham Potter was in charge is still at the club, playing alongside former Manchester United, West Ham and Lazio starlet Ravel Morrison. The up and coming club are still under English guidance, with 36-year-old Leicester-born coach Ian Burchnall currently at the helm as they look to clinch their first ever Allsvenskan league title this term. Ytterhogdals manager Adie Costello likens the standard in the Swedish fourth-tier to U23 football in England. "I would liken it to Under-23 football back home. It's very technical but with a competitive edge that academy football doesn't have. The English boys bring a physicality from years in EFL academies that the Swedes just don't have. We have to build the locals up," says the man who lists 'public speaking' among his skills on LinkedIn. 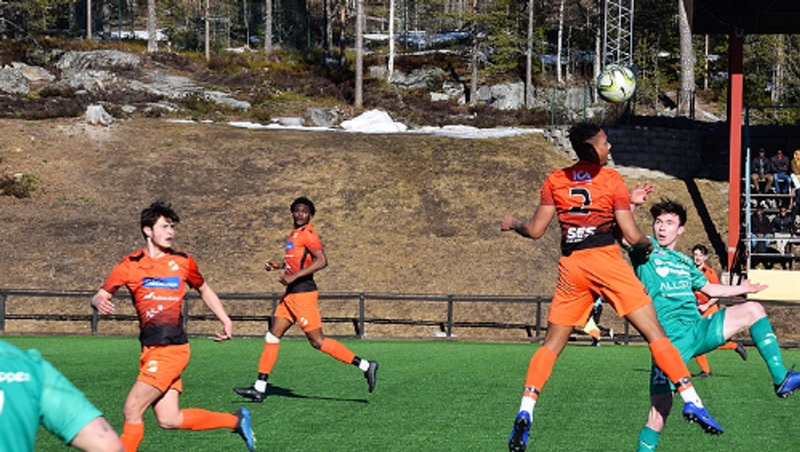 One issue that may rear its head should the club earn promotion this season, though, is that players from the local area must make up 50% of each matchday squad in the Swedish third-tier. Only four players from Costello's squad this season are Swedish, with just one making it into the starting lineup for the club's opening league fixture against Sandviks last weekend (which ended in a resounding 7-0 victory for the full-timers). With four points taken from their opening two league games, Ytterhogdals have started the season promisingly. The exciting young side currently sit second in the Division 2 Norrland table and travel to eighth-placed IFK Umeå as solid favourites this Saturday, with another win likely to take them top should current leaders Piteå slip up against Gottne - the side which held Ytterhogdals in a 3-3 draw on Sunday. With more and more young British footballers now pitting their wits abroad, using some of Europe's second and third-rate leagues to find a shortcut back into the professional game, we will undoubtedly start to see an influx of exciting young talents who have previously slipped through the net in England emerge once more as serious players with serious futures in the game. It may not be conventional, but it is both heartwarming and extremely interesting to see projects like this come to fruition. Ostersunds laid the foundations in which Ytterhogdals continue to build on - this is merely the beginning of something that could be very, very special for the development of young footballers in Europe. Quotes: Gavin Willacy for Playing in the Shadows via The Guardian.